Varanasi is the spiritual capital of India, home to no less than 2,000 temples of Hindu culture and tradition. The ghats and mandirs in this city provide ample opportunity to spiritually cleanse oneself, so strong is the presence in the city of all that is holy. Its patron deity is Kashi Vishvanath, whose temple is the biggest of all the ones located along the banks of the Ganga that flows through Varanasi. It attracts numerous pilgrims throughout the year, and houses one of the twelve jyotirlingas in the subcontinent. He is a manifestation of the Lord Shiva. The surrounding ghat, the Dashashvamedha Ghat, has its own legends. The name comes from the ten (das) horses sacrificed by Brahma in the Ashvamedha yajna that He performed here, having built the ghat to welcome Shiva to ihaloka (this realm). It is the largest and the liveliest of the ghat of Varanasi - with the fall of dusk, it comes alive with numberless aratis that are conducted by local priests in honour of the sacred river. 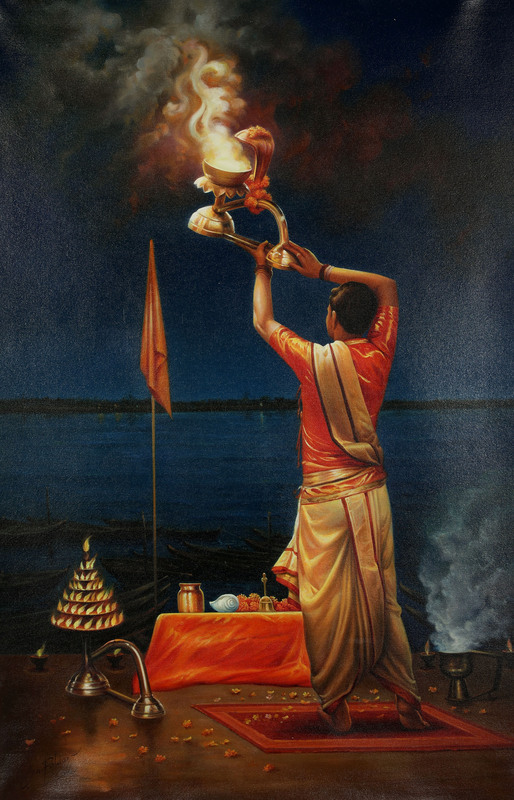 This painting is aglow with one such aarati, the goblet being majestically swung by a priest at a relatively quiet spot on the Dashashvamedh Ghat. The priest is in traditional saffron and ivory clothing. The sindoori rug he stands on is strewn with petals from the flowers of offerings he has made to the mother of all rivers. On a raised platform are arranged the stuff of traditional Hindu offering and aarati - a conch, a handheld bell, a bunch of fresh moist marigolds, and some libation contained in a jar. More lamps are placed at the side, from the earthen diyas to the traditional Indian lampstick and the crackling dhunuchi letting out the auspicious smoke. Note how naturalistic is the portrayal of the flames dancing in the winds brought forth from the Ganga. A number of rickety wooden boats are parked near where the dhoti-clad priest stands offering his arati, which one could make out against the inky blue of the Ganga by zooming in. The same is separated from the all-encompassing darkness of the nightsky by a film of black paint that constitutes the Varanasi cityline. Who is Brighter? The Full-Moon, or Shiva Himself?